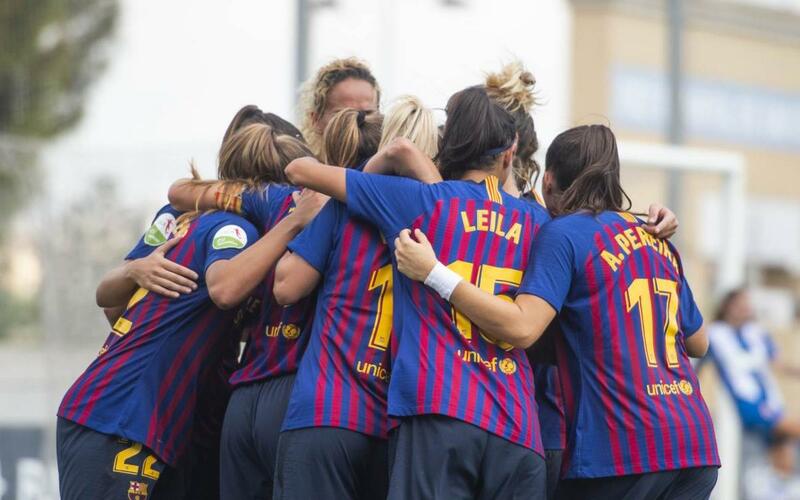 In what is traditionally a difficult away game for Barça Women, a performance that was far superior to that of their hosts saw the Blaugrana ease to a 0-3 win. Leila Ouahabi played an entire game after her injury and Patri Guijarro officially debuted this season. Fran Sánchez's players enjoyed the lion’s share of possession and opportunities from beginning to end. In the first minute of the game Lieke Martens’ great shot was saved by Mariajo, setting the tone for the rest of the match. Toni Duggan was next to try her luck but was denied by the post, with Mariona’s powerful drive also saved well by the keeper. Espanyol packed their own area meaning that Barça had to try their luck from distance. Within two minutes of the restart, Barça were ahead, Inés heading into her own net from a corner. The floodgates opened, the Blaugrana were more comfortable and the siege was constant. The second goal which ended the match as a contest came on 73 minutes: Aitana Bonmatí finding Andonova for an easy finish. The Macedonian player also assisted Mariona for the third (min. 81). Only the heroics of Espanyol keeper, Mariajo, ensured the win wasn’t greater.